Read here about tensegrity structures that are explicitly called masts by their creators. 2 Controversy About the Term "Mast"
A tensegrity mast is a tower-like tensegrity structure that extends primarily in a linear fashion, encompassing a prism or cylindrical-like space between its struts and tendons. Fuller, a former U. S. Navy officer, sailor and an inventor of tensegrity, named the classic tower a mast, borrowing from the terminology of sailing ships where the mast is the tall, vertical, or near vertical, spar, or arrangement of spars, that support the sails. Emmerich used this term as well, in French, "mât antiprismatique monogyre" (anti-prism-based spiral mast). Snelson avoided the term mast, and named his mast-like structures towers. For his most famous tower-like tensegrity, see Needle Tower. Tensegrity mast at the Indian Institute of Technology, Madras (Chennai, Tamil Nadu), 2011. Photo by Dawn. " Controversy About the Term "Mast"
Snelson objected to the nautical associations of mast, seeing them as peripheral to the main concept of tensegrity. Levin wrote: "According to Wikipedia et al, a beam withstands loads primarily by resisting bending. As there are no bending moments in tensegrity structures, 'beam' is probably not the best term. Towers are self-supporting or cantilevered structures, while masts are usually supported by stays or guys. Of the three, my vote is for 'masts', towers are too heavyfeeling, and I guess we can consider a tensegrity as internally guyed. Horizontally, it is a space truss. Sometime ago, I wrote a paper; 'The spine as a space truss', and maybe 'tensegrity space truss' might be a suitable descriptive term." Fuller often insisted on the fractal nature of tensegrity structures. Given a strut in a tensegrity structure, substitute it with a tensegrity mast of the same length and width. The process can be reiterated, substituting the new struts in the new tensegrity mast for other, tinier struts and tendons, and so on. He advocated for this fractal model of tensegrity masts as a good conceptual model for the atomic structure of reality, where tiny atomic nuclei are separated by vast spaces, cohering only by forces acting over a distance. Synergetics Fig. 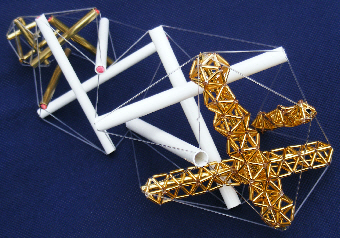 740.21 Tensegrity Masts as Struts: Miniaturization Approaches Atomic Structure. (c) R. B. Fuller" http://www.rwgrayprojects.com/synergetics/s07/p2500.html"
The model below by Scarr depicts a tensegrity mast and the fractal nature of tensegrity. The struts closest to the viewer in the image are tensegrity masts in and of themselves. The concept that tensegrity is fractal, at different orders of magnitude, was often discussed by Fuller in his lectures. Fractal tensegrity model, called structural hierarchy by Scarr." http://www.tensegrityinbiology.co.uk/biology.html"
Motro called this fractal structure the strut effect. The strut effect, as defined by him, occurs when an entire tensegrity is constrained to behave like strut under compression. Ingber and his team model the cytoskeletal stress fiber as a generic, planar tensegrity mast composed of multiple similar structural modules. Cytoskeletal stress fiber enables cultured cells to exert traction on their extracellular matrix. These fiber bundles extend tremendous distances--tens of micrometers in length--and insert into complexes at the boundary between the cell and its environment. These fibers are linear bundles of parallel actin and myosin filaments that also contain other actin-binding linker proteins, including tropomyosin, troponin, α-actinin and caldesmon. Thir components self assemble into a periodic three dimensional (3D) lattice reminiscent of the sarcomeric arrangement of thin and thick filaments in muscle. Cytoskeletal stress fiber has been shown to shorten and generate tension in intact living cells. Such cell-generated tensional forces drive changes in cell shape and and contribute to control of cell growth and function, as well as tissue patterning and mechanotransduction at the organ level. Ingber proposes the tensegrity mast as the most elegant model to explain both the fibers' supramolecular architecture and its mechanical behavior. 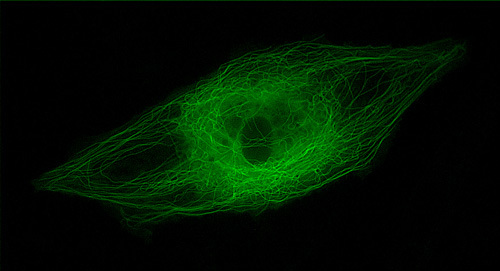 Microtubule filaments of the cytoskeleton of a cultured capillary endothelial by Ingber" http://www.childrenshospital.org/research/ingber/"
The cytoskeletal stress fiber tensegrity mast is 6 modules wide and 251 modules long. Each module is composed of 8 structural members organized in a prestressed tensegrity array in which tension cables form a continuous web that is balanced by compression struts. An additional member is added to the modules located at the ends of the tensegrity model to maintain the entire structure in a state of prestress. Cables are treated as viscoelastic Voight elements that support only tensile forces, whereas struts are modeled as linearly elastic elements under compression. Reference: A Multimodular Tensegrity Model of an Actin Stress Fiber by Yaozhi Luo, Xian Xu, Tanmay Lele, Sanjay Kumar, and Donald E. Ingber. Zoran Novacki patented a scissors-deployable-strut that is arguably a tensegrity mast. Novacki wrote, In the course of a research project about an innovative deployable truss structure at the Technische Universität München, an animated short was produced in 2009. Presented as a fictitious journey on Mars, the movie demonstrates the application of a deployable bridge structure along with its carrier on its mission bridging Mars. Reference: Bridging Mars by Zoran Novacki. Below, a gallery of images of tensegrity masts, with short descriptions. The Museum of Modern Art, New York City featured one of the original tensegrity masts in 1959. Make Magazine volume 6 featured instructions, by William Gurstelle, to build a 3x4 tensegrity mast. Flemons models the human spine as a nucleated, tetrahedral tensegrity mast. 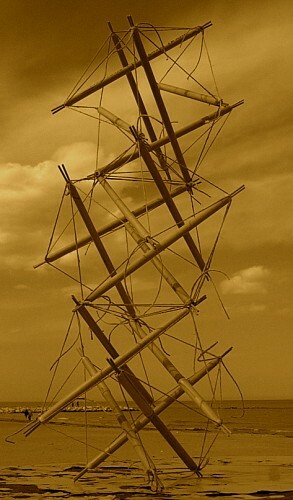 He wrote that the spine is often depicted as "a ship’s mast, stayed with cables... In this description the pelvis is the boat and the spine is restrained in its movements about a fulcrum or hinge (sacrum) by the large muscles of the back and abdomen. The discs are seen as shock absorbers which carry the dynamic loads of the body." Flemons goes on to criticize and refine this common conception. See spine for more details. Spines models 05-TVM-3.2, 05-SVM-3.1, 05-TS-1.1 Spiral Vertebral Masts by Flemons" http://www.intensiondesigns.com/models.html"
Cameron, Kassidy and Kelvin, a group of students studying at the University of Auckland Faculty of Architecture that call themselves the Triangle Collective, are basing one of their projects on a classic mast made of a 3 strut module repeated 4 times. They plan to clad the mast with zippered triangular panels of foil-coated emergency blanket. Tensegrity mast, 3 strut module x 4, by the Triangle Collective" http://thetrianglecollective.blogspot.com/2010/09/23082010-mid-semester-crit.html"
Functions of Positive and Negative Tetrahedra in Tensegrity Stacked Cubes Figure 730.11 from Synergetics by Fuller" http://www.rwgrayprojects.com/synergetics/s07/figs/f3011.html"
Fuller wrote, "We put a steel sphere at the center of gravity of a cube which is also the center of gravity of tetrahedron and then run steel tubes from the center of gravity to four corners, W,X,Y, and Z, of negative tetrahedron (A). Every tetrahedron's center of gravity has four radials from the center of gravity to the four vertexes of the tetrahedron (B). In the juncture between the two tetrahedra (D), ball joints at the center of gravity are pulled toward one another by a vertical tension stay, thus thrusting universally jointed legs outwardly, and their outward thrust is stably restrained by finite sling closure WXYZ. This system is nonredundant: a basic discontinuous-compression continuous-tension or "tensegrity" structure. It is possible to have a stack (column) of center-of-gravity radial tube tetrahedra struts (C) with horizontal (approximate) tension slings and vertical tension guys and diagonal tension edges of the four superimposed tetrahedra, which, because of the (approximate) horizontal slings, cannot come any closer to one another, and, because of their vertical guys, cannot get any further away from one another, and therefore compose a stable relationship: a structure." 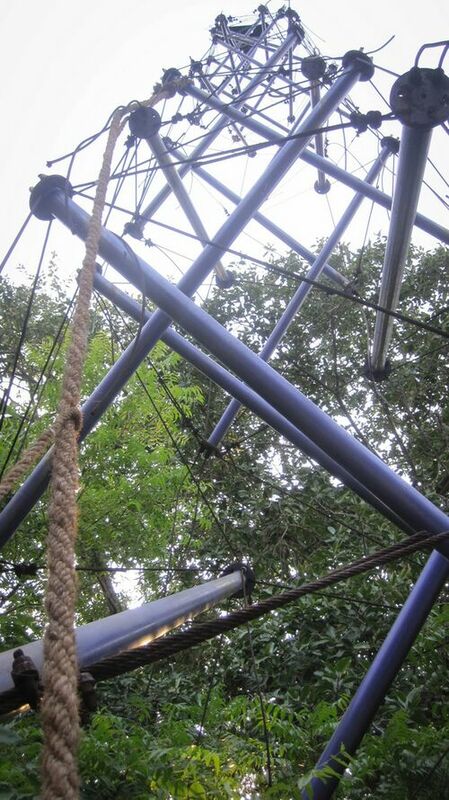 Stabilization of Tension in Tensegrity Column, figure 730.12 from Synergetics by Fuller" http://www.rwgrayprojects.com/synergetics/s07/figs/f3012.html"
Burkhardt constructed this mast in 1981, inspired by Hugh Kenner's book of Geodesic Math, and wrote, "This mast is based on the tensegrity prism. The top and bottom of the mast are tendon triangles as in a three-fold prism; the intermediate layers are tendon hexagons. Struts interconnect the layers. The intermediate layers are interfaces where two tensegrity prisms are connected. The struts are all the same length, although the perspective effect of the photo somewhat belies this. Tensegrity mast by Burkhardt." http://www.trip.net/~bobwb/ts/synergetics/photos/tower2.html"
Burkhardt went on, "I took care in the articulation of the stories so they all spiraled in the same direction, and this created a beautiful effect to my mind. The mast was very jiggly, and I thought this gave it less promise as a practical structure. That jiggling seemed to weigh more on my mind that its beauty and the geometric insight that went into it. I later found the same construction in David Georges Emmerich's book, Structures Tendues et Autotendantes (Paris, France: Ecole d'Architecture de Paris la Villette, 1988), where he does a lot of other things with prisms and agglomerations thereof. He calls it a "mât antiprismatique monogyre" (anti-prism-based spiral mast, p. 200). Since he seems to have thought of it first, I'll call it a mast. A similar structure, with prisms that alternate in sense rather than "monogyre" (spiraling) as above, appears as Fig. 5 in his French Patent No. 1377291. This mast isn't completely "monogyre" since the top stage spirals in the opposite sense from the other stages." Di Carlo posted a photo of a 6 strut module repeated 3 times tensegrity mast, built by the seaside. 6 Strut, 3 Module Tensegrity Mast by Di Carlo" http://www.biagiodicarlo.com/"
This page was last edited on 28 January 2019, at 11:27.